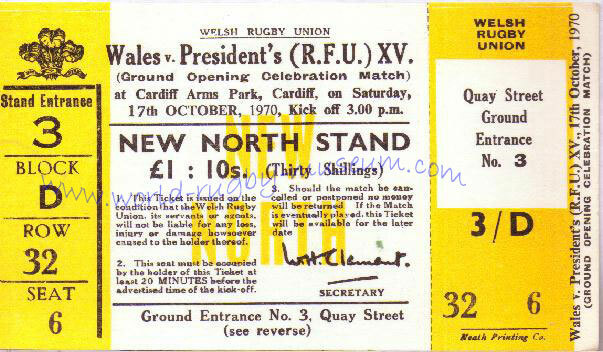 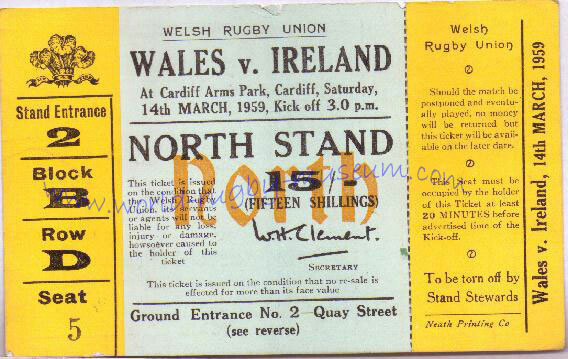 One of my everlasting memories of watching Welsh rugby in the 1970s is stepping off the train at Cardiff to the sound of "Any spare tickets, any spares". 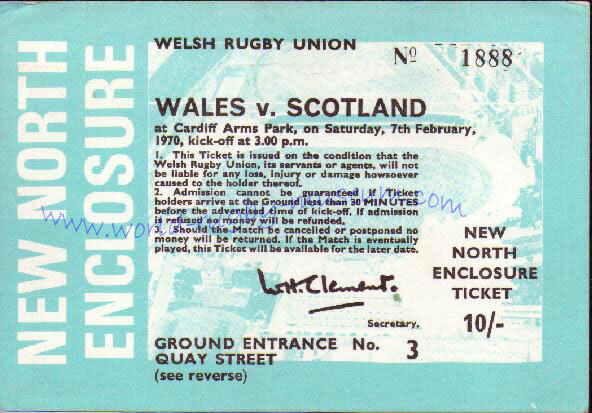 Cockney accents were the first you'd hear, ticket touts down for the day from London. 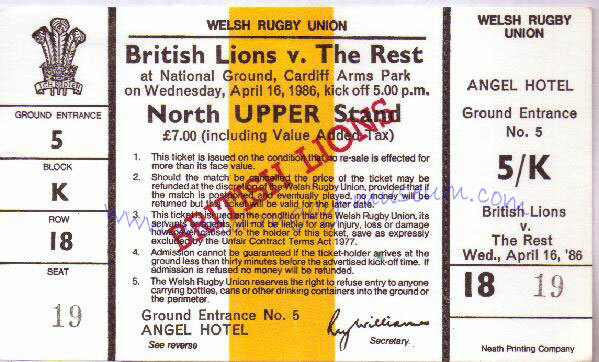 Then walking down Westgate Street and on every corner there was also someone looking for or selling tickets, the tickets selling for the biggest prices were always sold outside the Angel Hotel. 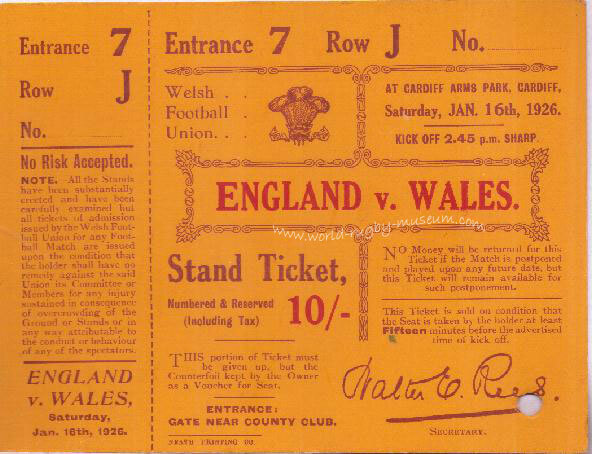 Then there would be the swappers, "East for a West", "A stand for two fields". 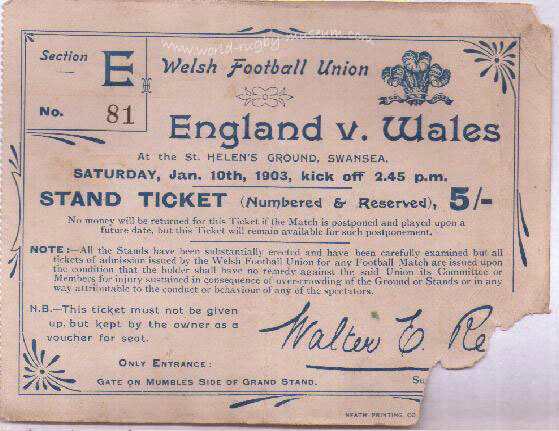 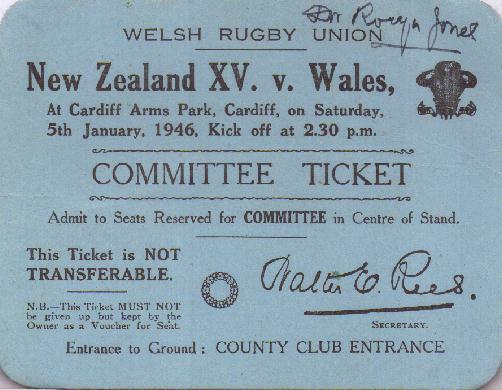 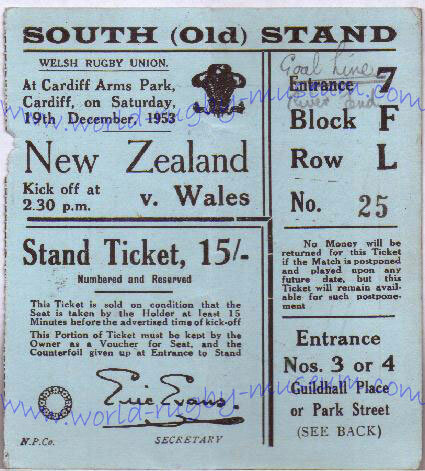 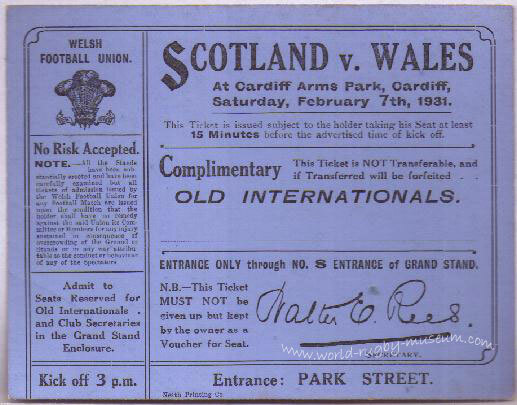 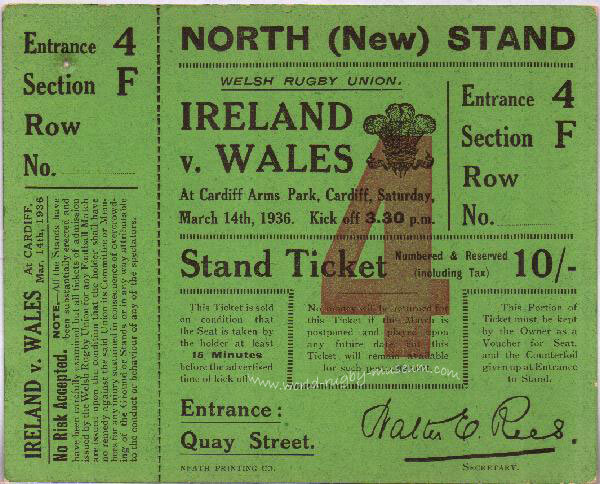 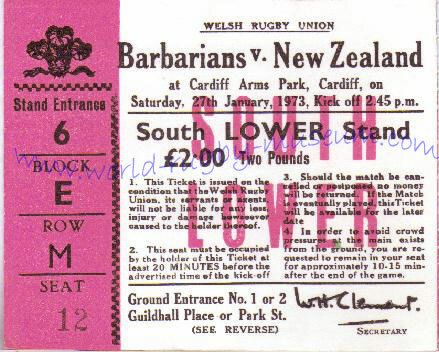 Below is a selection of tickets for international and other matches through the ages. 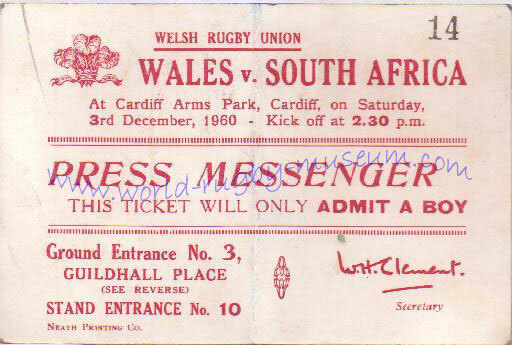 How many of these were sold on the black market I wonder ? 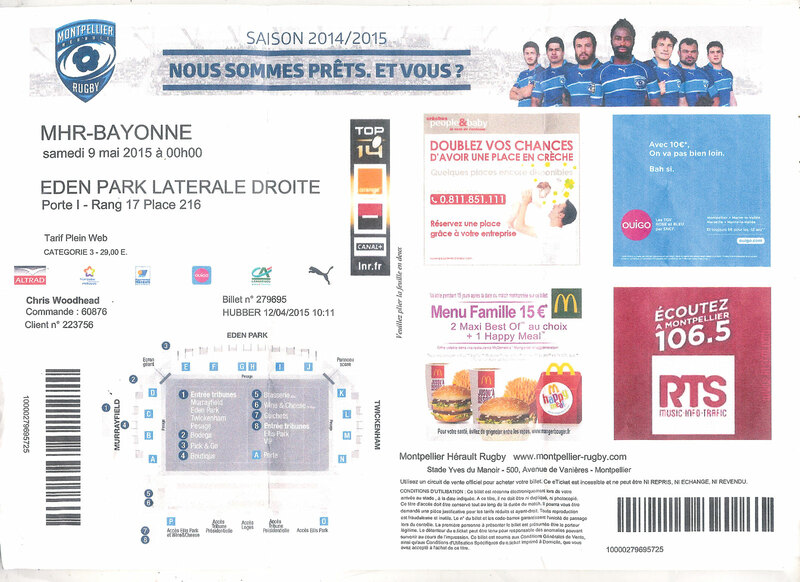 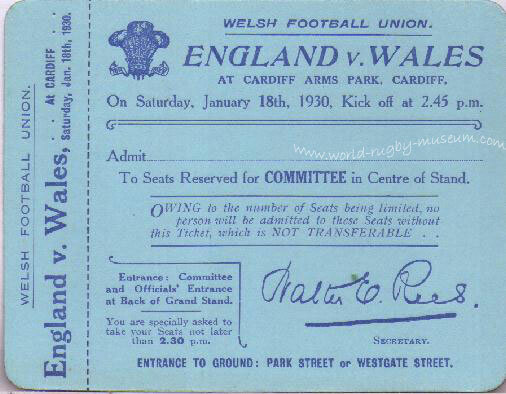 For a closer view of each ticket please click on the image. 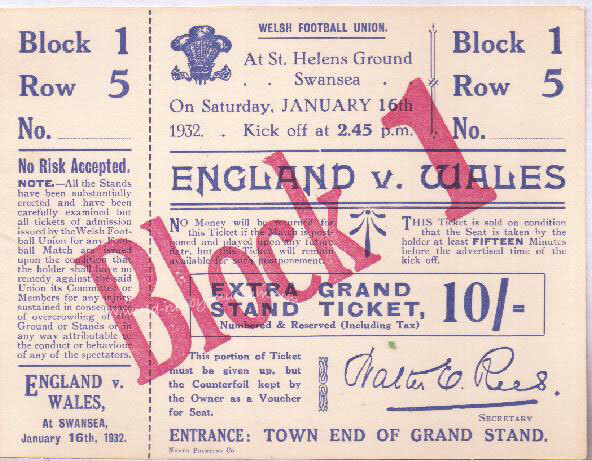 Dai's diary - One of my everlasting memories was of queuing to enter Twickenham in the England v Wales match of 1980. 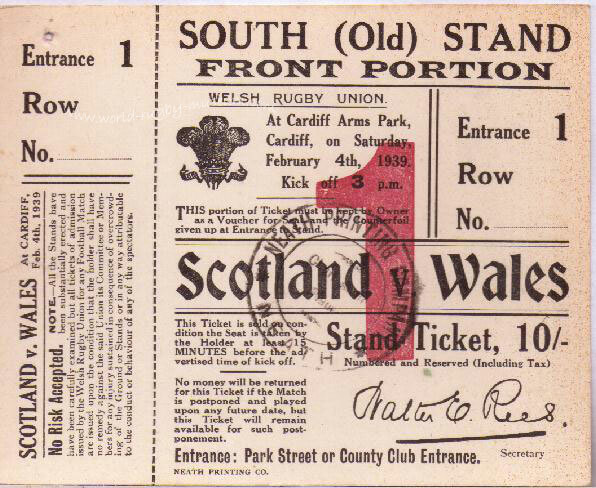 A member of Taibach RFC who I'd recently played against was standing just to the side of the queue looking down in the mouth, when I enquired as to what his problem was he showed me his ticket, a 'forgery' - poor lad, I don't think he ever did get to see that game ! 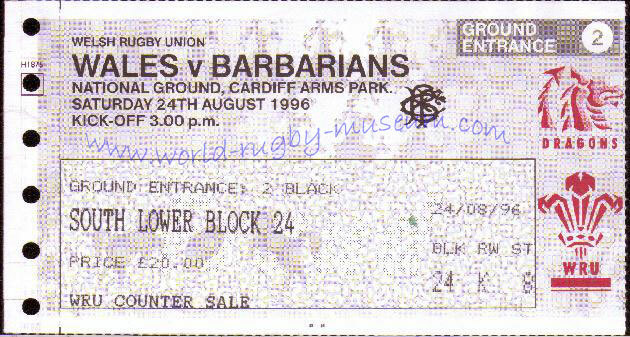 1991 - This night time international against France opened the new floodlights at Cardiff Arms Park. 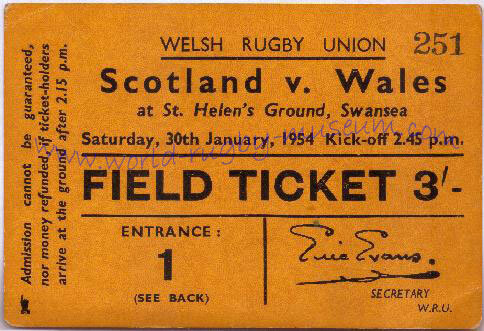 The tickets are now printed on continuous computer paper. 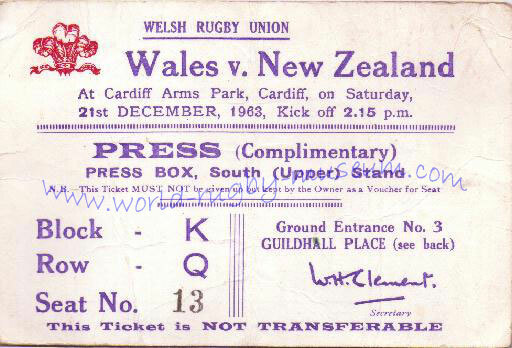 1987 - A new era in Rugby Union starts with the introduction of the Rugby World Cup, New Zealand are the co-hosts with Australia. 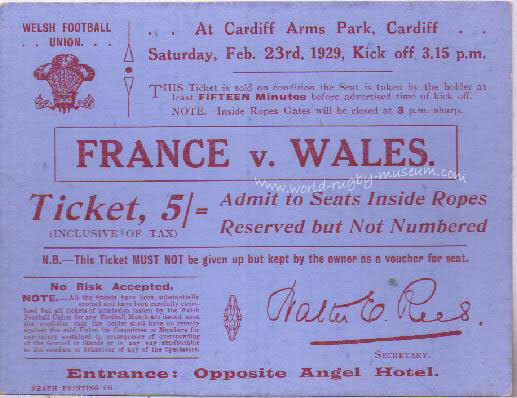 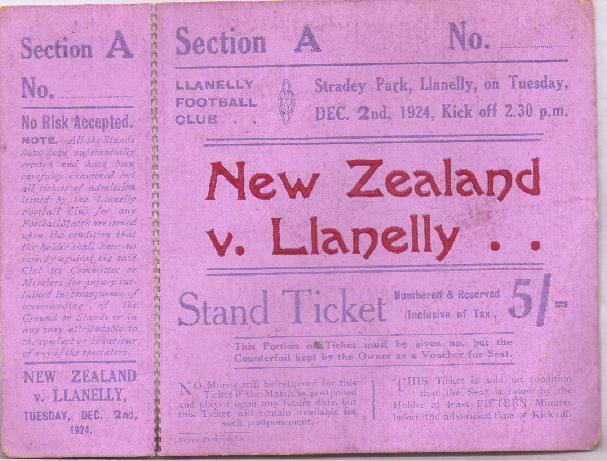 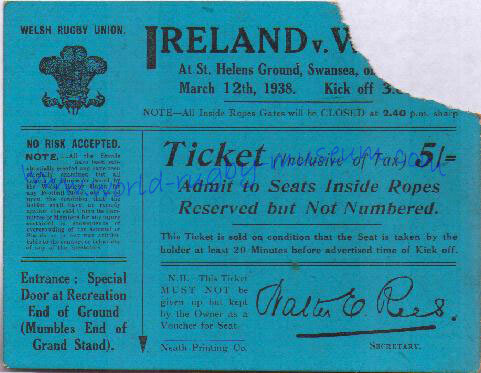 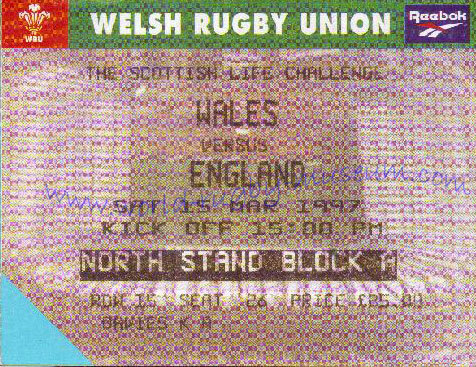 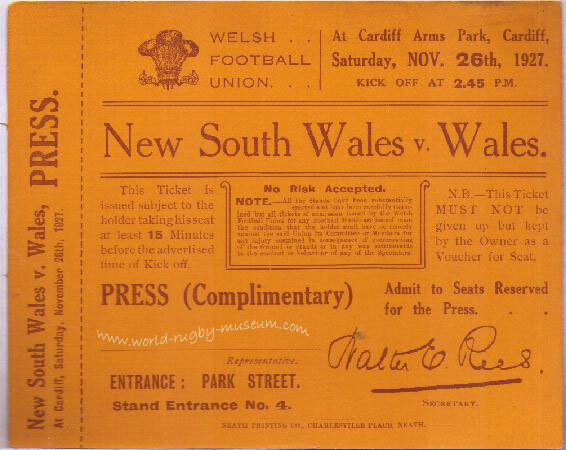 This ticket is from the opening match against Italy. 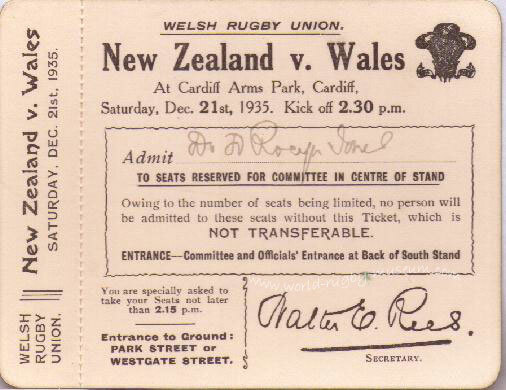 New Zealand won 70-6 and went on to defeat France in the final. 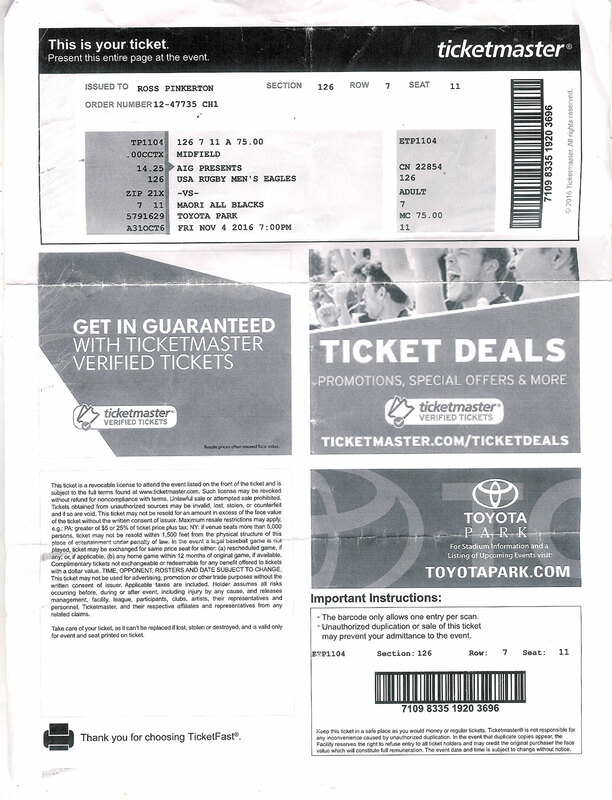 2016 - an A4 size on-line ticket from 'ticketmaster' for the match between USA and the Maori All Blacks at Toyota Park, Chicago. 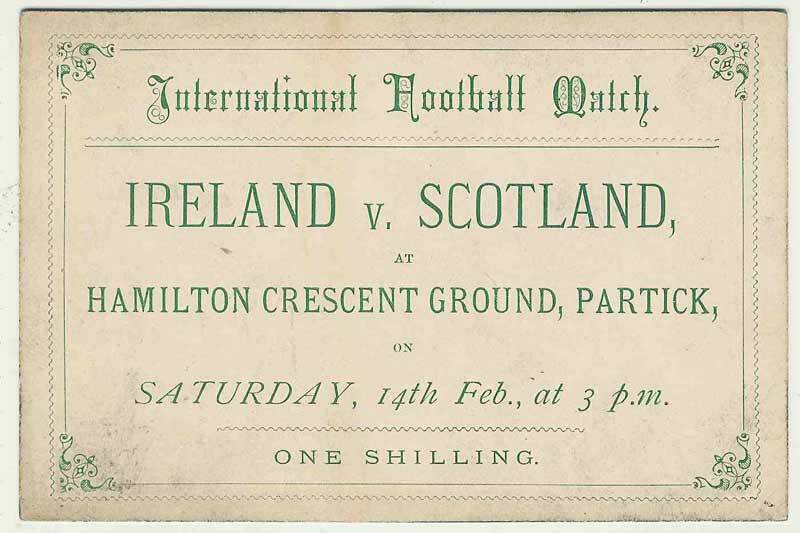 Thank you for visiting this page. 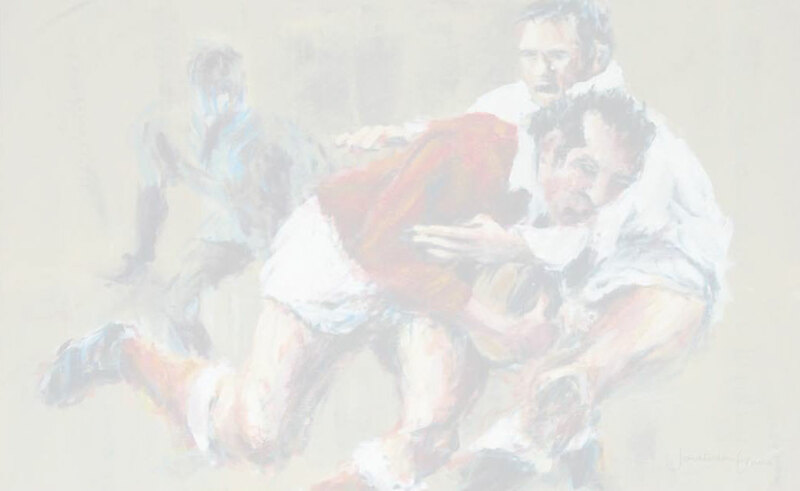 If you are able to contribute any other stories, photos or information or make a donation of rugby tickets to this page please click on the link below to email us. 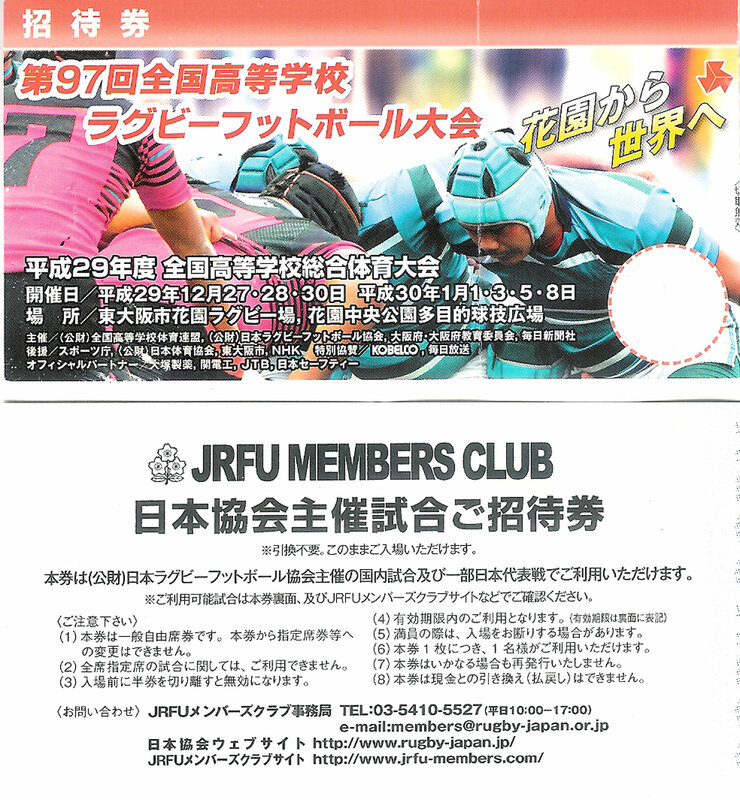 Acknowledgements: Dai Richards (WRM), Chris Woodhead, Bognor Regis, Yukihiro Iwase (Japan).